Pet dogs are more susceptible to separation anxiety because many of them can develop a very strong attachment to their owners. This behavior is inherent in dogs’ highly social nature. Cats, on the other hand, are more independent. It’s for this reason that most folks find it hard to believe that cats can also experience separation anxiety; but they do. Cats are fully capable of forming very strong relationships with their owners. Hence, they are also prone to separation anxiety. But how can you tell if your cat has separation anxiety and what can you do to help them? This is the purpose of this article. Read on. 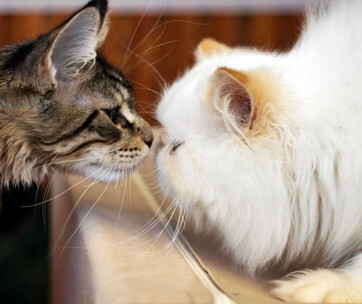 As mentioned above, feline pets have a more independent nature relative to their canine counterparts. Very few breeds of cats will follow their human masters like a shadow. Kitties prefer lying on their kitty couch high up on the cat tree. They prefer being the only cat in the house; although, if the owner introduces another kitty in a gradual manner, they can be playmates. Most cats are aloof, sometimes socially detached. Seldom will you see them put a smile on their faces like dogs do. Many felines do fine without anyone bothering to pick them up. As a matter of fact, some breeds do not like being cuddled or handled. The only time they will interact with their owners is during meal times and during the occasional playtimes. But this doesn’t mean kitties are incapable of forming strong relationships with their owners. Everything depends on the attitude of pet parents. If they shower the cat with lavish praise, warmth, and affection while it’s still a kitten, then there’s a good chance of developing a very strong bond between man and pet. In other words, the cat can develop an “emotional bond” with one particular person in the household. It’s what we call attachment. Herein comes the problem. If the kitten becomes too attached, it can grow anxious whenever that person it is attached to is missing or absent. And who is this “person”? You, of course. Hence, if you go to work or take a much-needed vacation, there’s a chance that your kitty may experience extreme manifestations of anxiety. It is the physical separation from the one that it is strongly attached to that’s making the cat anxious. This is why they call it separation anxiety. Keep in mind that the cat anxiety symptoms only manifests when the person that the cat is emotionally attached to is absent. When that same person is around, you won’t see such manifestations. This is what differentiates cat separation anxiety from other types of anxiety. It’s the physical separation that is making the cat anxious. One of the most difficult aspects of cat separation anxiety is their symptomatology or the manifestations of anxiety. Unlike dogs that have this condition, cats do not show very obvious signs of stress or anxiety. Many of these clinical presentations are very subtle, with some mimicking normal and expected behavior in cats. Let’s take a look at these cat anxiety symptoms. We’ll start with the behavioral manifestations first. Similar to anxious dogs that bark whenever their pet parents aren’t around, anxious kitties will also do different vocalizations. Most will meow, while others may growl, chatter, purr, or trill. In most instances, however, anxious cats will let out a long and “sad” meow. But here’s the problem: all cats meow. 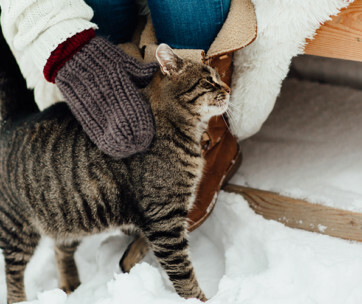 If the increased meowing only occurs when the pet parent is out, then it’s most likely a sign of cat separation anxiety. Here’s another possible manifestation of cat separation anxiety. Everyone knows how cats love to groom themselves. But when it becomes very frequent, then something’s off. The issue, of course, is how will you know that the self-grooming behavior is already excessive or not? Besides, there’s no one in the house to see the cat doing the excessive grooming. Maybe someone is in the house, but how does he or she know that the self-grooming behavior in the cat is no longer “normal”? Regardless, this can still be a sign of anxiety. In our opinion, this is a more pronounced indicator of separation anxiety. This is especially true if the cat is well-trained to use the litter box. It makes no sense that a litter box-trained cat will defecate and urinate all over the house. Something’s not right. In some cases, the cat may also soil on its owner’s clothing and other personal items. It may urinate or defecate on beddings, mattress, and clothes. Don’t be mad at your cat. It is only trying to mix its scent with yours as a means of soothing and alleviating its anxiety. Again, if house-soiling occurs also when the person of affection is around, then it’s not separation anxiety. All cats scratch. They love to sink their claws onto hard objects and try to rip them apart. It’s part of their nature as predators. But then, if you come home from work and you noticed that your sofa, bed, and other upholstered items have claw marks on them; then you may have a serious cat separation anxiety issue. If the cat has its own scratching post or cat tower, there’s no need for it to scratch and claw other items in the house. This can only mean one thing. Your kitty is very anxious. Reclusive behavior in cats can be quite difficult to ascertain. For starters, there’s no one in the house to see if the cat is acting strange or not. Does it stay in a well-hidden place the entire time you’re not around? Does it only get out of its hiding place the moment it hears its owner entering the house? If there is someone else in the house with the cat, then determining this behavior is a lot easier. This household member can tell you that he didn’t see the cat the whole day. This is a rather peculiar behavior that some folks associate with cat separation anxiety. Bolting food is all about gulping down the cat food like it’s the cat’s first time to eat such food. The problem is that this is not always a sign of separation anxiety. It can also mean that the kitty has diabetes or hyperthyroidism. In some instances, it may have intestinal parasites that are eating up the nutrients inside its tummy. It can also occur during the first few hours upon the pet owner’s arrival. You may notice the cat to show excessive clinginess or attention-seeking behavior. This occurs prior to the pet owner’s leaving the house or right after arrival. The cat will do almost anything to get its owner’s attention. It may shadow him or her around the house or rub its body against the owner’s leg. Many of these behavioral manifestations of cat separation anxiety are quite difficult to ascertain. One has to be in the house to “observe” these behavioral manifestations. In addition to these cat anxiety symptoms are physiologic manifestations such as the following. Again, these signs are not exclusive to separation anxiety in cats. The vet needs to conduct a more thorough examination of the cat to rule out possible medical conditions. If there is none, then the treatment plan will be more focused on behavioral therapy. If the physiological manifestations persist, the vet may recommend symptomatic treatment. Managing separation anxiety in cats starts with a visit to the vet. This is important since many of the manifestations of anxiety are also attributed to medical conditions. It’s important to rule out any organic cause of the anxiety to help maximize the benefits of behavioral therapies. In general, treating any organic cause can help solve the anxiety issues in cats. If there isn’t any medical condition, then you can start initiating some changes in your household. One of the best ways to address separation anxiety in cats is by helping them get accustomed to you not being around. Start with very brief periods of “absence”. Walk around the block. Go to a neighboring store. Whatever you do, it’s important to leave your cat alone for a short period of time. Start with a 5-minute absence. And by “absence” we mean the cat will not be able to see or hear you. Do this for about a week or so. Next, increase the “periodic absence” by another 5 minutes but do so only when the cat is not making a fuss about your absence. Sooner or later the cat will get used to your prolonged absence. Cats are intelligent. They know if you are about to leave them. They are very observant and they can connect the dots with relative ease. For instance, they may associate your leaving with picking up your keys, putting on the makeup, or wearing your office clothes. One thing you can do is to execute all of these “pre-departure” activities without going out of the house. What you’re teaching your cat is for it to stop associating these “activities” with your departure. If it sees you pick up the keys yet you’re staying inside the house, it will know that you’re not leaving. The next time you pick your car keys, the cat will not make a fuss about it. Many pet parents are guilty of reinforcing the anxiety of their cats. Whenever they leave the house or arrive from work, they often lavish their cats with attention. Stop doing this. Lead a more normal, fuss-free departure and arrival. This tells the cat that you are not at all worried about leaving it behind. You know that you will be back so you are not anxious. Remember that pets have this uncanny ability to recognize anxiety in their owners. Your body language says it all. So, skip the petting before departure and head towards the door without saying goodbye to the cat. 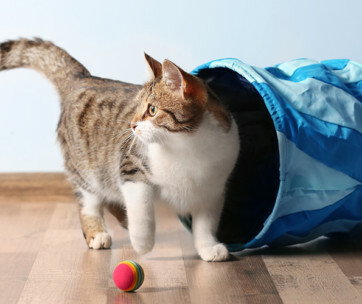 Another great way to manage feline separation anxiety is by keeping them busy. Giving them interactive and puzzle toys helps. These allow kitties to focus more on the task at hand rather than on its feeling of loneliness and solitude. Food puzzles, robotic cat toys, ball-on-track toys, and catnip-filled toys can help your kitty feel more relaxed and calmer. There are a number of cat-friendly TV programs that your kitty can watch. There are also audio-visual materials that cater to the needs of cats with separation anxieties. Some companies also provide soothing music to help cats relax. Try to allow a certain space in your house where you can put up a small perch for your cat. These pets love looking outdoors in the backyard. You can try putting up a bird feeder system outside the glass window so your cat will have something to watch. Sometimes, your cat only needs another kitty it can play with. However, when introducing a new cat in the household, it’s best to do it in a methodical and gradual manner. Cats are territorial and they don’t like having another cat mess with their resources. One of the most important tasks of a cat sitter is to make sure the anxious cat gets the attention and affection it needs. It needs playtime and petting sessions of at least twice a day. For pet parents who may be away for several days, someone will have to stay with the cat overnight. This is to keep the cat’s stress level low. Separation anxiety in cats is almost similar to dog separation anxiety. However, the signs are subtler, making them a bit trickier to spot. Regardless, the management will almost be the same. It focuses on alleviating the anxiety and modifying the cat’s behavior.